A man was wheeled away in a stretcher Monday afternoon following a large SWAT team response at the Heart O' Chicago motel. 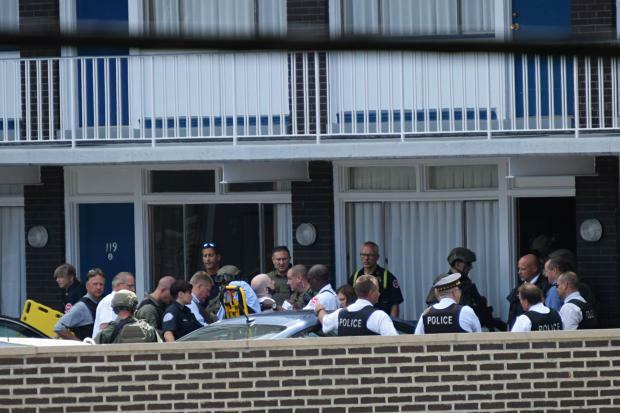 EDGEWATER — A suicidal man holed up in the old Heart O' Chicago motel in Edgewater Monday afternoon, leading to a tense standoff that ended peacefully after nearly three hours. 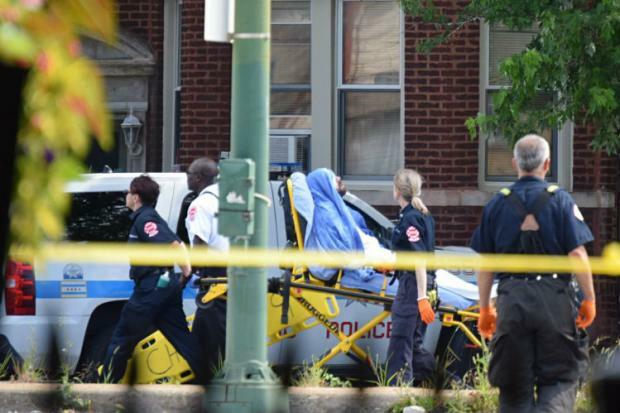 A police source said the man was saved without incident before 4 p.m. A man was seen being wheeled away in a stretcher following a large SWAT team response at the motel at 5900 N. Ridge Ave.
"It's a save," the police source said. Dispatchers were notified of the incident around 1 p.m. at the motel. A person who answered the phone at the vintage motel said they were with the police and told not to comment. Following the arrival of what appeared to be a police robot, a man was wheeled out on a stretcher around 3:30 p.m.
Police classified the situation as an "HBT," meaning it was a hostage, barricade or terrorism situation, according to Officer Nicole Trainor, a Chicago Police spokeswoman. Police later added that the situation is not terrorism-related. Traffic has been closed all along the triangle formed by Peterson Avenue, Clark Street and Ridge Avenue. Drivers were being asked to get off the northbound Lake Shore Drive at Foster Avenue instead of Hollywood Avenue, police said. Multiple squad cars and SUVs, fire trucks and SWAT, police vans, mobile commander and K-9 units have arrived at the scene over the last hour. Emergency vehicles were staged at and near an empty parking lot between the hotel and a White Castle restaurant. A fire department rehab unit was set in a nearby White Castle parking lot for officers and other emergency personnel to get water as the afternoon heats up. The scene has drawn plenty of onlookers and passersby at the already heavily-trafficked intersection and commuter thoroughfare. Frank, a 28-year-old resident who lives near Hermitage and Ridge Avenues and only wanted to give his first name, said police told him and other neighbors to stay in their homes. Residents who live directly across from the motel were asked to get off the first floor of the building, Frank said police told him. Frank said when he came home from work Monday afternoon and noticed police, detectives and SWAT teams zooming into the neighborhood he "knew something was wrong." "To hear SWAT in your own neighborhood, it's shocking and disturbing," he said, adding he would like to see increased security cameras outside the motel.